Join us for an unforgettable evening of friends, fun, beer, wine & painting in Toronto. Looking for the perfect date night? Drop in freestyle painting or a creative art workshop with a coffee, tea or treat from our café is a great way to spend an evening. Book a kids' or adult painting party at the studio. Create some unique art and relax in our café lounge! Our kids’ parties are fun creative and innovative. 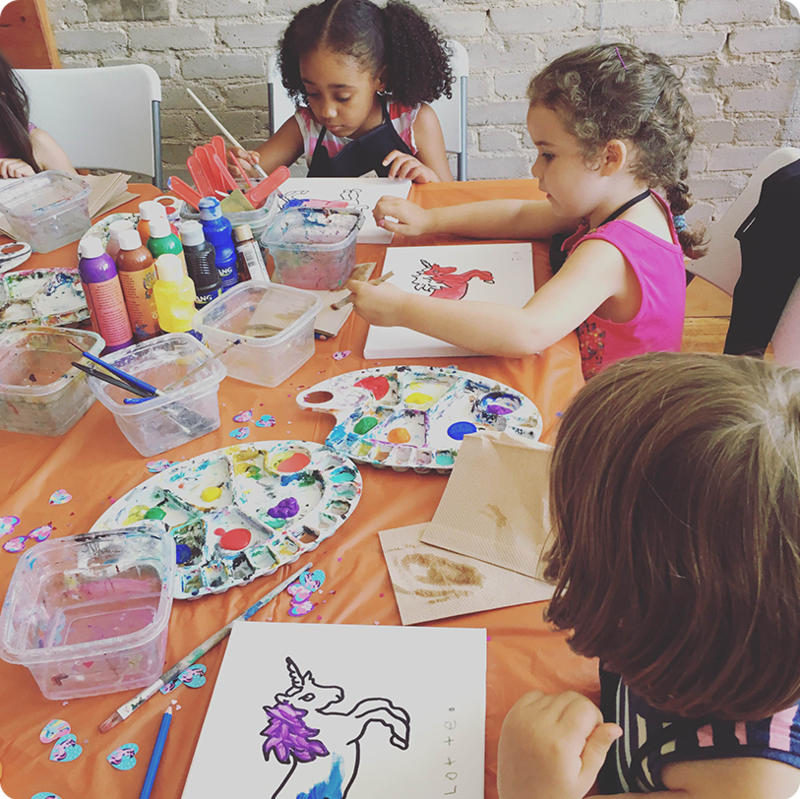 Fresh Paint Studio offers everything from LEGO art parties, glass painting parties, slime art parties and more! Let us do the work of keeping the kids busy with art while the adults enjoy a coffee or tea in our café lounge. Is your company or organization looking for a way to tap into the creativity of its members or employees? Is it looking for a way to enhance organizational bonding and team work? 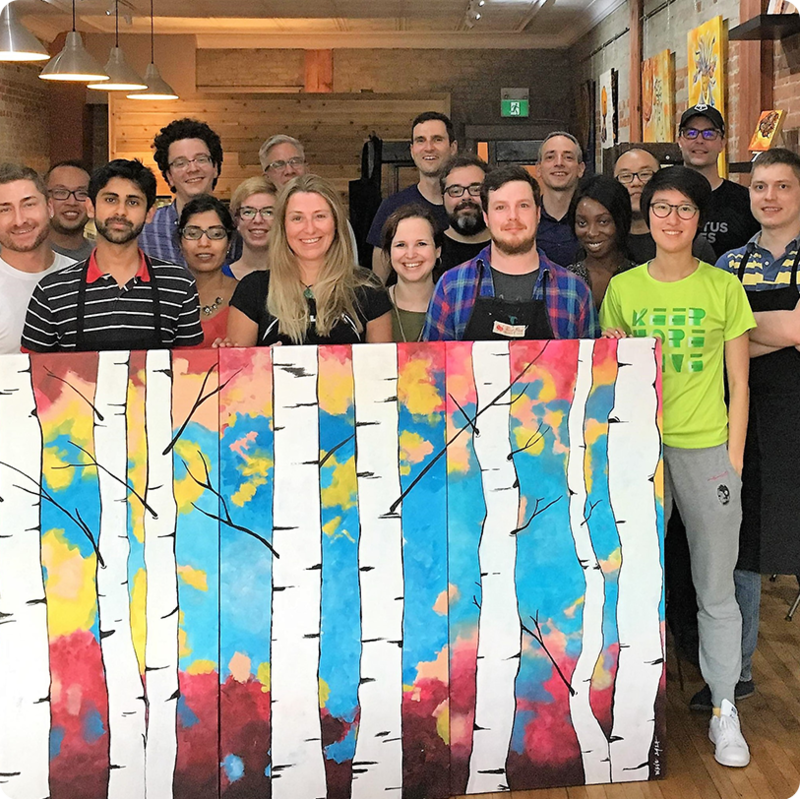 Fresh Paint Studio’s corporate team building activities can help to inject energy, enthusiasm and creativity into your team building events and offsite meetings. We host in studio or offsite creative corporate painting events for small groups of 6 to over 100. Remember those days when you used to explore your creativity with a sense of freedom and pure happiness? At Fresh Paint Studio, we want to bring back those good old days. We want to inspire your artistic creativity once again. At our Toronto art studio, you will have a chance to create art freely without apology. We will supply the materials and you just have to bring your inspiration and creativity. Just relax, unwind and create! All in a warm and inviting studio that allows you to indulge in a coffee, tea or treat while you paint. We offer freeflow drop in painting sessions for kids and adults, art workshops, painting parties for kids and adults, corporate painting parties, private painting lessons and more. Fresh Paint Studio’s exposed brick, high ceilings and open studio space create a warm and inviting experience. We invite you to come and create art fearlessly while enjoying a coffee, tea or treat in our café. You can also enjoy a bit of down time relaxing in our studio lounge space. Six visual artists. One cheering crowd. 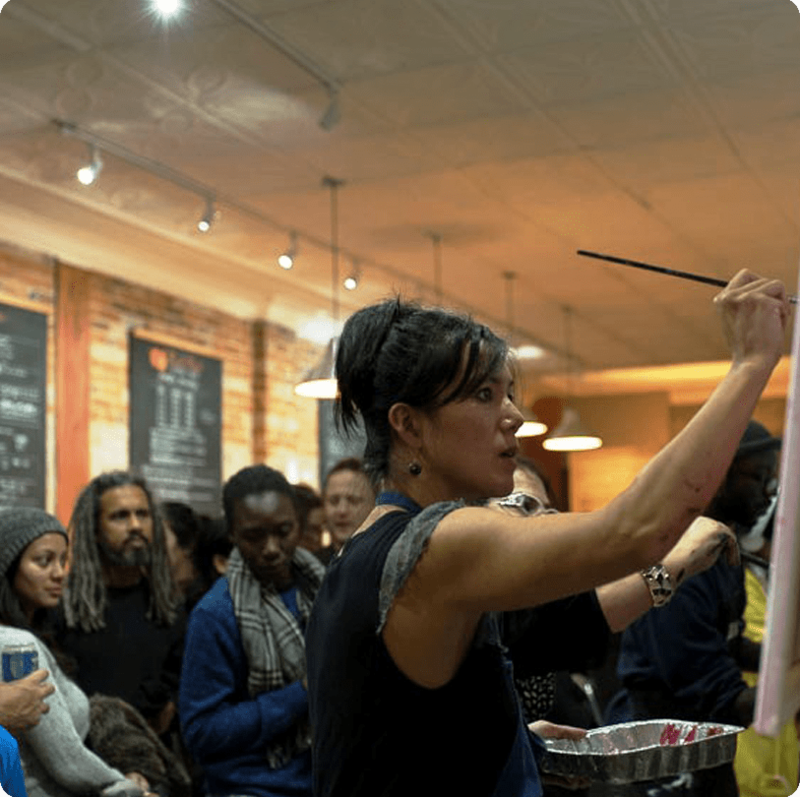 Six artists will be selected to participate in The Art Slam. These selected artists will be given the theme of creation for the night when they arrive. 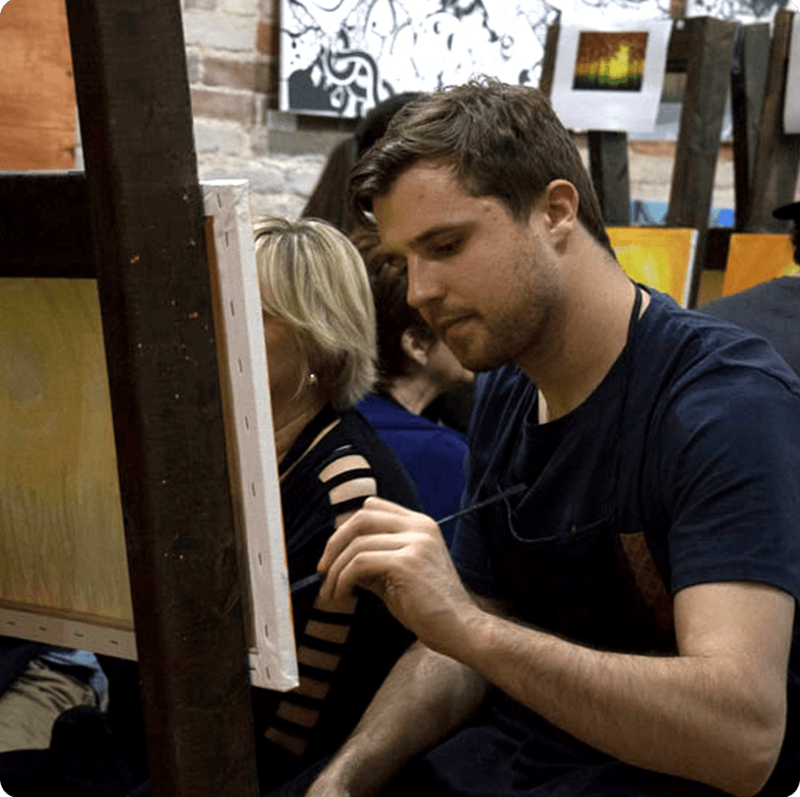 They will then have one hour to create their pieces and express their artistic vision surrounded by a live audience and music being pumped out by the DJ of the night. When the hour is up, artists will drop their paint brushes and then the slam is on! We host painting parties in a warm and inviting studio space that allows your guests to indulge in a coffee, tea or treat. Our open studio space with exposed brick, and high ceilings inspires creativity. Grab your coworkers, friends or family and let us host your next painting party. We offer fun and creative painting parties and art workshop options such as wine glass painting, batik, silk scarf painting, and more. Lego art, glass art & slime art parties! Our kids’ art parties are innovative, creative and fun! Let us handle the art while the adults enjoy a coffee or tea in our innovative and inviting studio space. We understand that creating art can uncover a lot a fear about the process – not to mention the end result. At Fresh Paint Studio, we want you to have a relaxing, fun and creative experience. Our staff of artists is here to help and encourage you to create art fearlessly. The session was incredible! Team had fun painting and enjoying a glass of wine, they got to relax while still being able to build as a team. They were proud of their art work and can't wait to hang it in the office. Roxane from Fresh Paint Studio was amazing to work with, she was accommodating, responsive, and made booking the event very easy. My team and I had a wonderful afternoon at Fresh Paint Studios. With Roxane's guidance we were all able to create our own personal 'masterpieces'. It's a perfect team event because there is time to relax, chat and discover our hidden talents all while sipping on a nice cup of tea. I would love to do it again soon - maybe with my family next time!